Thought I would share our bald eagles with you. We have a resident family of a male, female and they had 3 eaglets this year. Adult bald eagles are the ones with the white heads and white tails. Young bald eagles are brown mottled colored. It takes about 3 years for their heads & tails to turn white. The female eagle is larger than the male, so I'm able to tell one from the other and came to know that the female is missing a flight feather from her left wing...very noticeable when she flies above me. And they have a fairly large vocabulary...all sorts of chattering, squawks, screeches, clucks, etc. Never realized that eagles were that verbal...and very noticeable when all that chatter comes through our bedroom window at 5 a.m.! I've watched them do all sorts of antics...aerobatics in the air, clutching each other's talons in mid-flight, swooping & diving, or sometimes practically just motionless hanging in the air. I see them everyday and still stop to watch and marvel at them every time. The 'babies', who look bigger than their parents, due to them probably just being fluffier, did their first flight about 2-3 weeks ago. They had so much fun learning to fly---sometimes a big clumsy and much irregular flapping going on, but once they got going they were just swooping with great speed just for the fun of it I think. There has been some sibling arguments when one will have a piece of fish and the others want it, so the one young one was being chased by his siblings and ended up dropping it just a mater of a few feet from where we were standing. A few practice swoops and one of them picked it up. 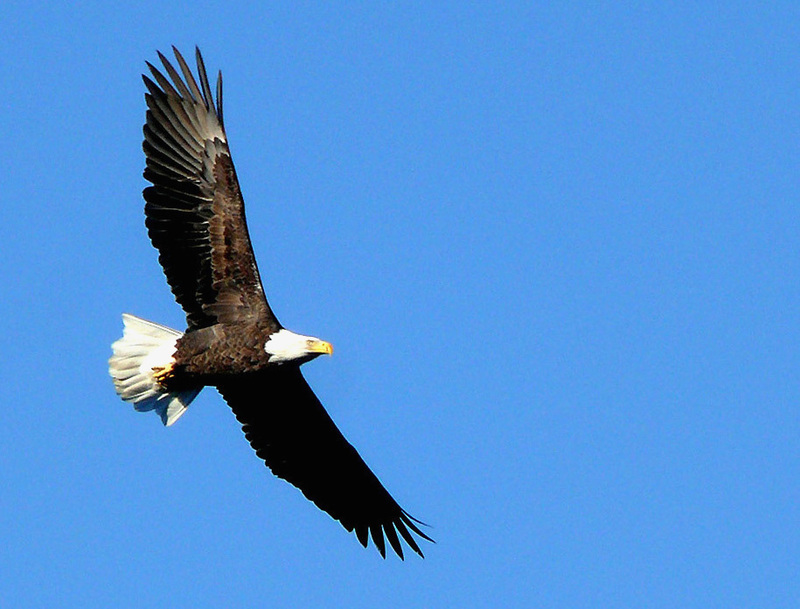 Recently we've had as many as 9 eagles in the air above us, 4 adults, 5 eaglets...so must be a 'visiting' family. :) There has been lots of rivalry though, mostly between the adults and young ones. Yesterday was a big chase...one young eagle had a fish, everyone else wanted it. The chase entailed all sorts of aerobatics, screeching and antics involved. One adult would not give up the chase...they were getting pretty close to where I was standing sometimes. The young one dropped it, the adult continued to chase the other and drove him crashing into the trees. They were flying at break neck speed, so the crash was very audible, twigs breaking, flapping, screeching, etc. The adult pulled out of the swoop before he hit the trees and just flew off...never bothering with the dropped fish. I waited awhile and wondered if I should go into the bushes to see if the eaglet was okay, but then he awkwardly detangled himself from the branches and inches his way over to the outer edge of a large branch. Feathers looked a bit mangled, but he fluffed and got himself together. I couldn't see him very well, but he did sit there for about 20 minutes before he took off. The crows got the forgotten spoils. We've witnessed disputes before and a favorite ploy is to drive the other into the bushes or just ram them. Who knows what goes on in eagle hierarchy. Like I mentioned, you wouldn't believe all the empty pictures of blue sky with nothing in it pictures I snapped. This picture is just a lucky fluke...adult did a couple of very low overpasses in a slow easy ride the wind glide and I managed to get this. My little camera's zoom was to the max and so it's a good thing that the eagle was just hanging there and not moving much. He or she, was very relaxed and just chillin'. :) So there was a lot of activity going on while I was painting the fence! Well remember the on-looker...he didn't move a feather during this whole episode, even when his sibling crashed just below and to the left of him. And and when I turned to look back in that direction, look who is sitting just above him!!! But nothing happened. End of story. When the eagles fly above, all the crows, gulls and pigeons seem to stay low or out of sight, so I guess you know who rules the skies. They are not on any food chain, so man is basically their only threat as far as I know. I know many people with cats have a bell on the cat's collar to warn birdies. Well around here a bell on a collared cat is a 'dinner bell'!!! There was a cat that came by from time to time that had a bell, but haven't seen it in a couple of months. We warn all our guests with pets about that...keep them leashed and keep them close. I've heard of an incident where an eagle grabbed a small dog that was on leash and yanked leash and dog from the pet owner's hand. In the early spring I was out walking and looked up to see an eagle carrying something and once my eyes focused on what it was carrying I realized it was an orange and white cat. It gave me a jolt for a moment. But I've been told that in an eagles nest or at the bottom of their tree you can find lots of pet collars and leashes. Ewe...!! !